I ended up changing my mind about what book to finish off the What's In A Name Challenge with. As I was getting ready to leave for the hospital last month for surgery, I grabbed the closest book to me, a Weather Warden book by Rachel Caine, Ill Wind, the first in the series. I didn't actually read while in the hospital (although I did end up staying the night), but a reader has to have a book handy just in case, right? I have since polished off all the books in the series along with a few Christmas romances interspersed to help get me more in the mood for the holiday. Guilty pleasure reading for a mind and body that did not want to have to work too hard during those first weeks of recovery. I also, admittedly, watched a lot of television. I am only now starting to get back onto the computer. I am still in recovery, although feeling much more like myself these days. There is still some discomfort and I tire easily. My family has been a big help, although I really am ready to take back laundry duty despite the doctor saying not to just yet. I am also not allowed to vacuum, which is fine by me. The cats love having me home with them during the day. I have a feeling we'll all be a little sad when I return to work come the beginning of the year. I hope to get back to visiting blogs very soon. We're in the process of changing internet providers, so fingers crossed that goes without a hitch. I am looking forward to continuing on with the novel. It is easy for a life to become unblessed. Mary, in particular understood this. Her mistakes--and they were legion--were not lost on her. She knew all about the undoing of a life: take away, first of all, your people. Your family. Your lover. That was the hardest part of it. Then put yourself somewhere unfamiliar, where (how did it go?) you are a complete unknown. Where you possess nothing. Okay, then--this was the strangest part--take away your history, every last bit of it. Faith - I am enjoying it so far! Sounds fascinating! I'm guessing the author intentionally used a snippet of lyric from Bob Dylan's "Like a Rolling Stone" (like a complete unknown). So appropriate for the time in which this book is set. Sandra - I think it was intentional too, Sandra. The book is very good so far. I haven't been able to read much today, but hopefully this evening. What an unusual title. Sounds interesting though. Suzie - It's such an interesting time in history, and yet really not all that long ago. Wendy, so glad you stopped by and also that you updated us on your progress. Glad u r doing well. I like the intro and am curious for more; it sounds a bit different. I hope you are feeling better soon. I am not too crazy about the opening of this book. I think I would have to read more though. Pat - Thank you! I am feeling better every day. It'll be nice when I am back to full health though. I'm not good at being helpless. The opening is not very revealing, is it? Take care and get well soon, Wendy! Melody - I almost read Eat the Document last year, but it wasn't the right time. Hope recovery continues smoothly. I like the opening of that book. I'm glad you're recovering so well. Leave the laundry and vacuuming to others as long as you can! Kathy - Thank you. It's hard for me to rely so heavily on others to do things I need done for me when I'm used to doing them myself. In some ways, it's been nice--but it gets old after awhile. I am wondering how she got where she is and why? I am going to look for this maybe at my library. Judy - I'm wondering that too. I know the story will be a sad one when I find out. I hope you are able to find it at your library. The book sounds good, and I like the opening. Jenclair - Who would have thought resting would be so difficult? LOL When I was in more pain, it was easier to take it easy. Not so much now that I'm feeling mostly normal again. I find myself doing more only to realize I've pushed myself too much too late. I remember being intrigued by your current read, and then it fell off my radar screen. I'll have to add it back to the reading list. The book has been sitting on my shelf for awhile now--I'm glad it won my attention again. It's worth reading, I think. This one hasn't really captured me, but I hope you enjoy it! Kim - I'm loving it so far. Oh, yes, the kind of story that hooks me, since I was young during that time (60s, 70s) and knew people who took off, who protested, who made mistakes. Thanks for sharing...and I hope you are feeling better soon! I'm excited about this one. My dad was a Vietnam Veteran and, a result, it's a big part of my own history. Oh yes, I would continue reading it. I want to know about her. Topazshell - I hope you do decide to give the book a try. It's good so far! I am glad that your recovery is going well. Continue to be good to yourself and take it slow. Those poor books languishing on the TBR shelf. I need to rescue a few. Happy reading. Nise' - Thank you! Remembering to take it slow is the hard part. I didn't get nearly as many of those TBR books rescued from the shelves as I had hoped while out on leave. Glad you are feeling better! This book sounds like an interesting read. Thanks for stopping by my blog today! Monica - Thank you! I've enjoyed it so far. I think surgery recovery definitely calls for fluff fiction and lots of TV! I had very minor oral surgery a month or two ago and it took a good 24 hours before I felt like my brain was even close to my own again. Glad you're feeling on the mend! This does sound interesting. 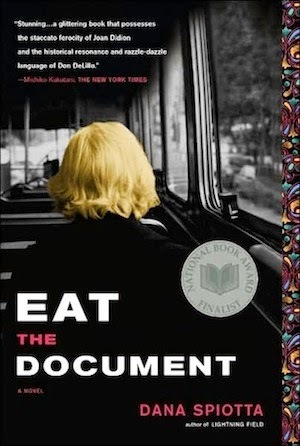 I don't think I've heard of Eat this Document. Look forward to the review! Katherine - Yes, I think you are right. Fluff and television. :-) I finally got around to watching Broadchurch and really liked it. Watched the second season of Arrow. LOL Too much TV. A.M.B. - Thank you! Me too!